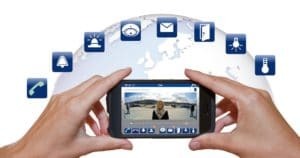 The MxControlCenter video management software can connect any number of cameras at any locations into a straightforward and powerful video security system with centralised or local, user-based operation and evaluation. This advanced program, specifically tailored to the high-resolution MOBOTIX network cameras, offers a user-friendly interface and camera display, convenient video search, practical alarm handling, automatic camera integration, video storage on file servers and a useful configuration and update assistant. Once again, the decentralised camera technology plays a part as the system advantage of decisive importance. Because the MOBOTIX cameras and not the video management software perform the computational work (e.g. movement detection, recording, storage, etc. ), MxCC needs only one standard PC with a monitor as the hardware platform. The modern system configuration based on the Internet Protocol (IP) can set up and manage security projects of any size extremely economically using standardised network components and connection paths that are usually already available. To find out more about the Mobotix video management solution contact us.